Social medias had been making a buzz about the boy who had been a holdup victim and was given a bicycle. 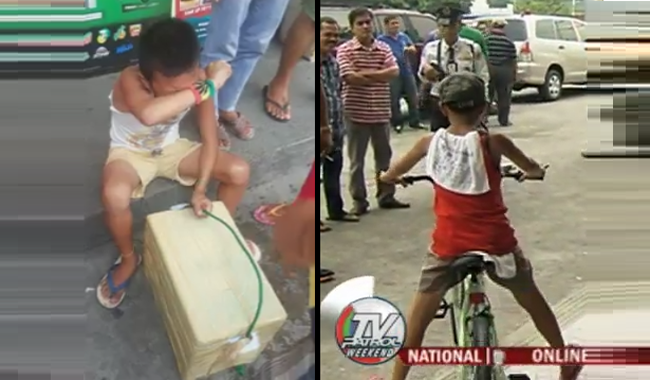 According to the ABS-CBN News, the police are still looking for the holdup suspect in the case of a boy selling pandesal. In a video posted online by a concerned citizen, the boy named Arnold was shaking in fear and shock after a man took his hard earned money of 200 pesos in Deparo, Caloocan. The boy hidden with the name Arnold recounted his story and said that a man had cupped his mouth and pointed a knife at his side and then took his money that he had earned by selling bread. He was calmed down after he enjoyed riding a green bike given by the local government of Caloocan. The boy went under debriefing and counseling. The councilor believed that the child is still undergoing trauma. The mother clarified that she never asked her son to work. The boy himself had chosen to work just to buy a bike. She even said that the boy won’t stop working and even had secretly goes out just to sell pandesal. It is clear under the law that parents can not make their minor children work. The viral video was upload by Christopher Pacheco on his Facebook profile.